Miscanthus Giganteus Single Rhizomes quantity of 100br/br> Single rhizomes will be 3-6" long and about 1/2" in diameter. 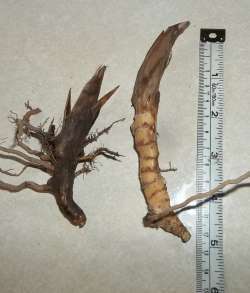 Planting single rhizomes is recommended only in early spring and late fall when conditions are wettest, or when supplemental watering is available. If conditions are too dry the success rate on single rhizomes is not as good as our larger divisions that contain several rhizomes attached. However, they will work well if moisture is maintained during the first few months after planted to help establish these plants.You can expect 2-4' of height from single rhizomes the first growing season. If you are looking for more height sooner, larger divisions will work better for you. Recommend planting rate is 18"-2' for this size of starter plant. Allowing 2 years before dividing off these plants is also recommended.